Not sure if you can make it? View our opening times here. Are you interested in becoming an Air Cadet? If so then you have come to the right place. 114 Squadron is a friendly and welcoming place that hosts all the normal air cadet activities and more! 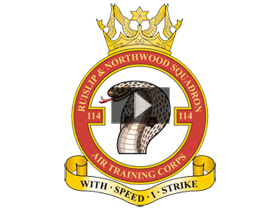 Take a look at our squadron video to see some of the fun we have. So that you are not alone when you join we hold either open evenings in the winter and open days in the summer. This gives you and your parents the chance to look around and see what we do. The open events are based around our recruit intakes so that there is a group of new recruits so that you do not feel alone. The intakes are usually about three weeks long so if you find that you like it here then you have a chance to bring along a friend or two! On your first evening you will find out a bit more about the squadron and the ATC. This also gives you opportunity to ask any questions. If you find its not what you are looking for, no problem, just let us know that you will not be coming again. More often than not, new recruits can't wait to get into activities. When you start you will be going through a training programme so that you have the correct knowledge to be able to do all the activities as soon as they become available. Cadets will be measured for their uniform a short while after they have joined us. This is to make sure that we are able to get the correct size of uniform for your passing out parade. The uniform consists of dark blue (working dress) and light blue (wedgewood) variations. Each recruit will be taught how to prepare their own uniform and when you wear it for the first time, it is really something that will make you feel proud. There is only one part of the uniform that you have to buy and that is the parade shoes. When you start you will be asked to wear smart clothes, this could be either a school uniform or a shirt and tie. Although most of what we do in the ATC is funded by the RAF (thats including your uniform), we do have to charge a monthly subscription. This subscription is currently £10 per month. Are you interested in joining? If so click here to apply or click here to visit the FAQs to find out a more.